For us, it all started in 2008. 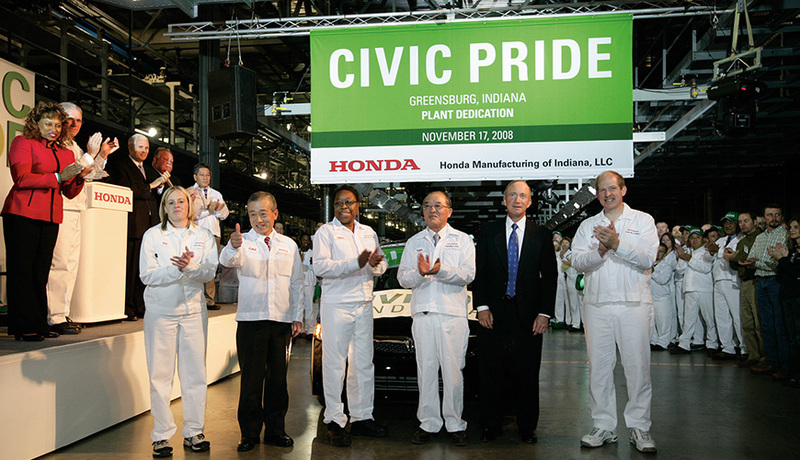 That’s when the first Civic rolled off the line here in Greensburg, Indiana. On that day, something remarkable began. A new facility for achieving was launched that now creates thousands of vehicles every month. Our economic impact has been massive while our environmental impact has been minimized. We’ve strived to be a value to our community, and create value for our customers. Our success is thanks to our exceptional team, and we’re proud to be a part of an exceptional global corporation. And we can think of no better place to build on the track record our company has established than right here in Indiana. To achieve that goal required thinking that went well beyond the plant’s physical structure. For instance, the lakes that surround the facility act as natural aquatic filters, protecting the nearby farmland from sediments associated with runoff. And we have rehabilitated a vital floodplain with new creek-side forest growth that will enhance biodiversity. That level of concern we have for the natural environment is equaled by our concern for the work environment. The vehicles we build in Greensburg are the result of an all-encompassing philosophy of quality. Measured in more ways than just fit and finish, quality is central to our operation. It can be found in our use of electric motors instead of hydraulics to reduce noise and odor. Our paint spraying systems were designed to produce less airborne loss. Both of these innovations reflect a systematic approach we have taken to improve the quality of our working environment. 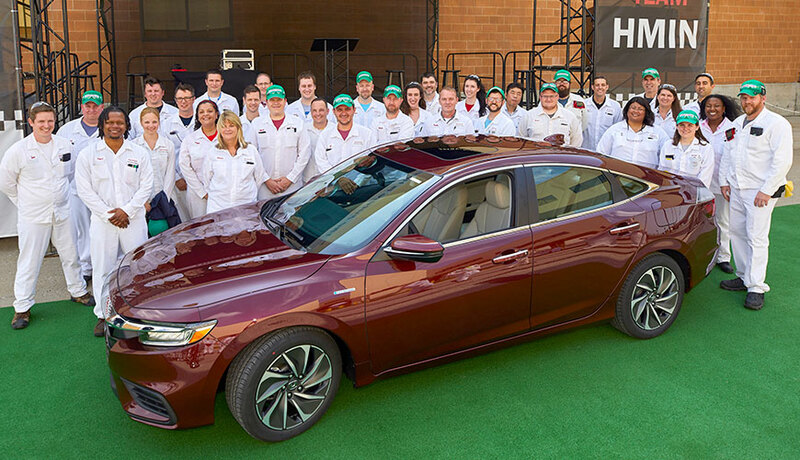 At Honda Manufacturing of Indiana, we are honored to produce the Civic Sedan, the car that helped establish the Honda reputation for quality and efficiency, the Honda CR-V, the first SUV built at the plant since we began production, and the all-new 2019 Insight Hybrid. But we are equally committed to our roles as corporate citizens and environmental stewards in Greensburg and across our state. A modest family business in bicycle repair launched Honda founder Soichiro Honda’s passion with the mechanics and engineering of automobiles and motorcycles. Since then, Honda has grown to become the world’s largest motorcycle manufacturer and one of the leading automakers. 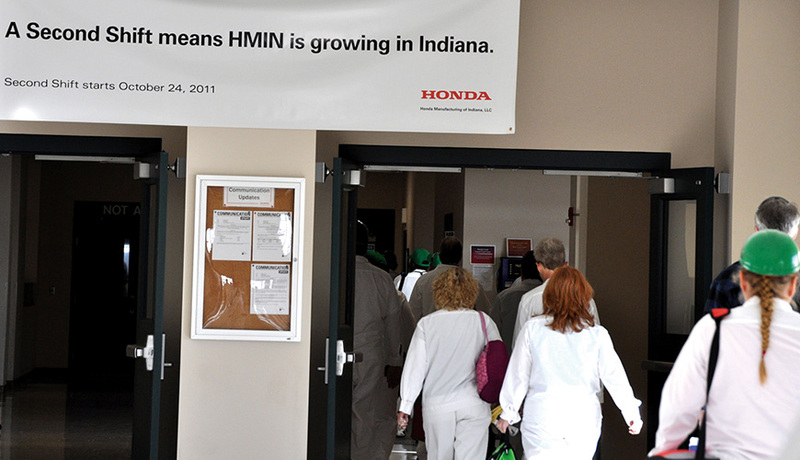 With a global network of subsidiaries and affiliates, Honda develops, manufactures and markets a wide variety of products ranging from small general-purpose engines, scooters and even jet aircraft. And even though Honda continues to redefine innovation, one thing remains the same—our founding principle. Respect for the Individual reflects our desire to honor the unique character and ability of each individual person, trusting each other as equal partners in order to do our best in every situation. Our belief and desire that each person working in, or coming into contact with our company, directly or through our products, should share a sense of joy through that experience is reflected in another set of long-held principles we call The Three Joys—The Joy of Buying, The Joy of Selling and The Joy of Creating. Since its establishment in 1948, Honda has remained on the leading edge by creating new value and providing products of the highest quality at a reasonable price for worldwide customer satisfaction. In addition, the company has conducted its activities with a commitment to protecting the environment and enhancing safety in a mobile society. For more information about Honda Global visit world.honda.com. 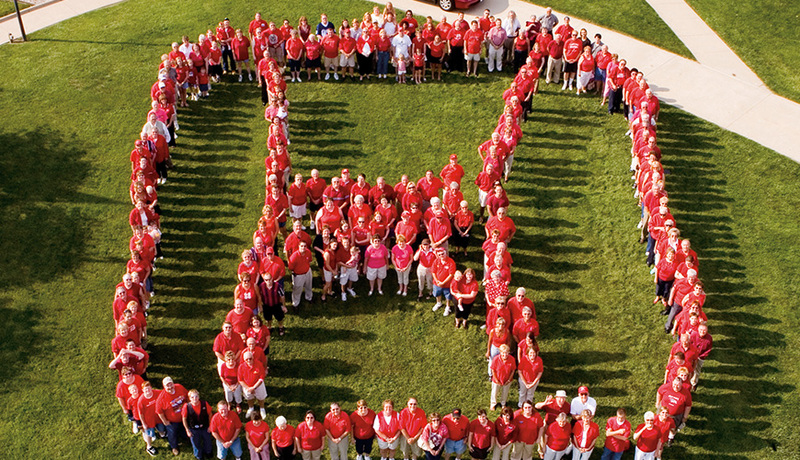 Honda announces plans to build its seventh North American auto plant in Greensburg, Indiana. The site is selected in part because of the community, infrastructure and central location. Indiana Governor Mitch Daniels is among the dignitaries to break ground. The state-of-the-art facility will encompass 1.3 million square feet. 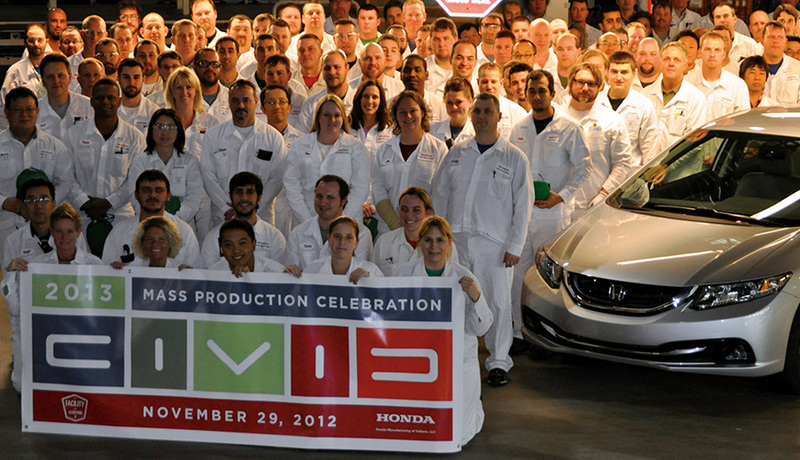 Mass production kicks off as the team starts building the fuel-efficient, four-cylinder Honda Civic. At full capacity, the plant will produce 200,000 vehicles per year. 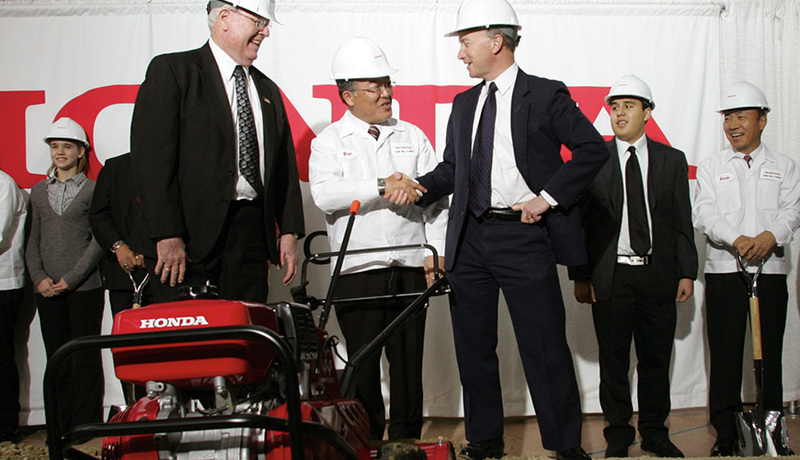 ​Honda President Takeo Fukui, Governor Mitch Daniels and Congressman Mike Pence are all on hand as the plant is dedicated, just one month after it begins production. 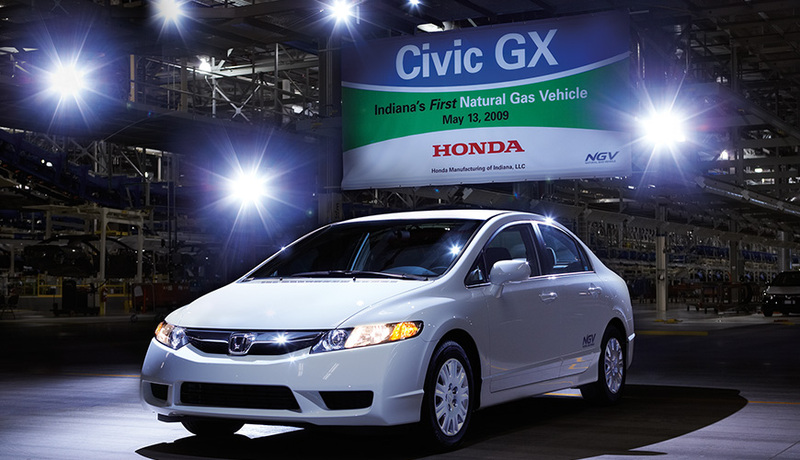 ​Less than one year after starting production, Honda Manufacturing of Indiana begins to export its cars. The vehicles are destined for Mexico, Latin America and the Caribbean. 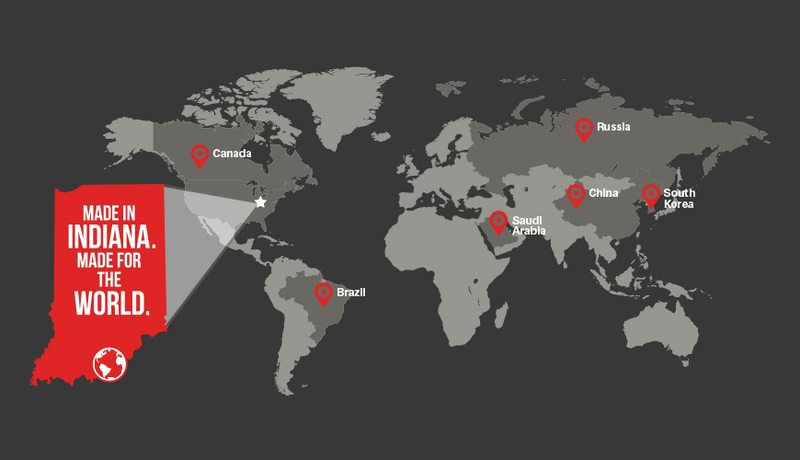 Today, HMIN exports all over the world. 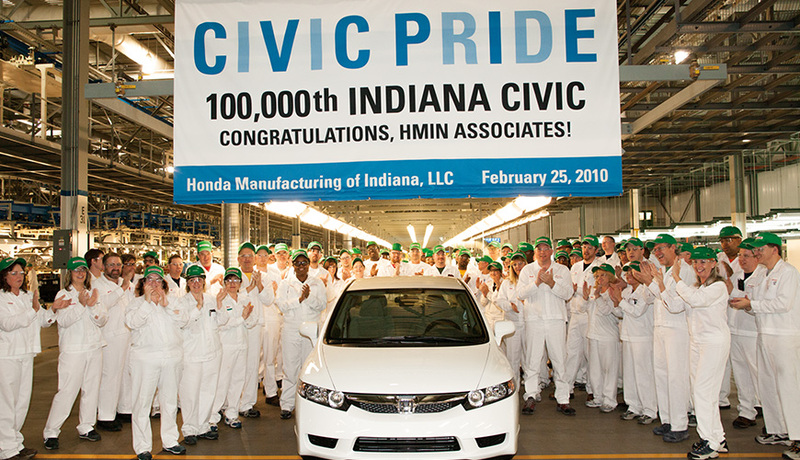 ​Associates celebrate the 100,000th Civic produced in Greensburg. 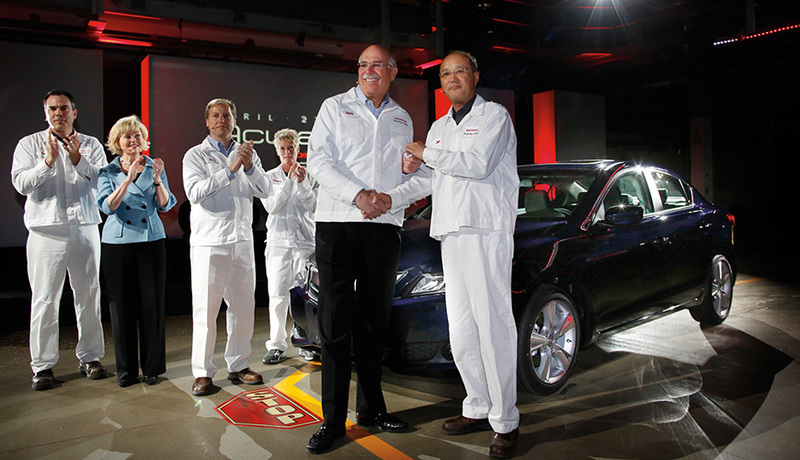 Company leaders attribute the success to the team’s dedication to building quality products for Honda customers. 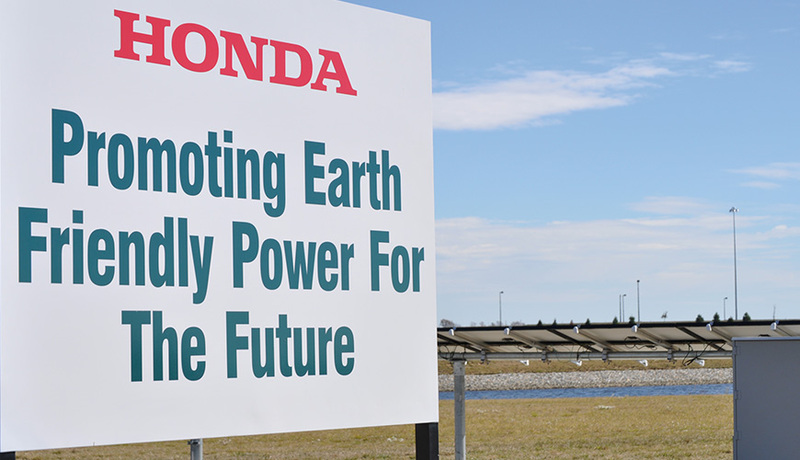 ​On September 2, Honda installs panels to test the use of solar power. Later, on October 4, the facility earns LEED certification (Leadership in Energy and Environmental Design). 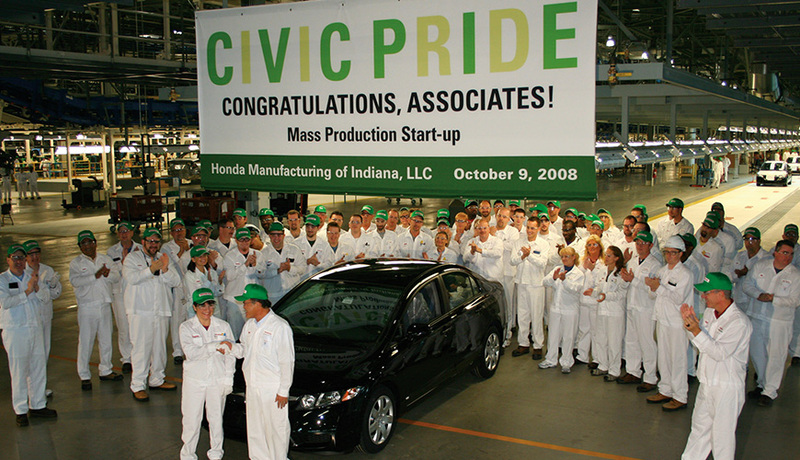 ​Associates begin 2012 Civic mass production, with a focus on continuing the excellence that makes the vehicle a customer favorite. 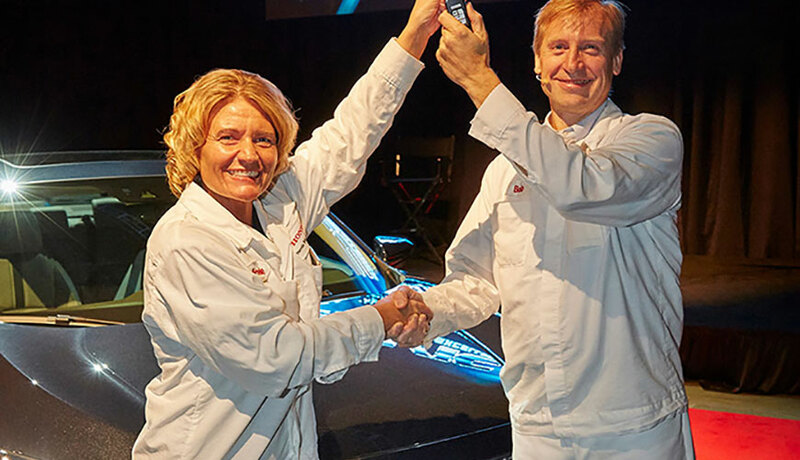 ​Honda’s Greensburg facility is one of three plants from around the world to receive the top award for quality from J.D. Power & Associates, the Platinum Plant Quality Award. ​A second shift of associates begins working. The expansion creates 1,000 jobs, doubling the current team and making a huge economic impact in Indiana. ​Indiana Lieutenant Governor Becky Skillman is on hand as the all-new Acura ILX rolls off the assembly line for the first time. Greensburg is the exclusive producer of this vehicle. 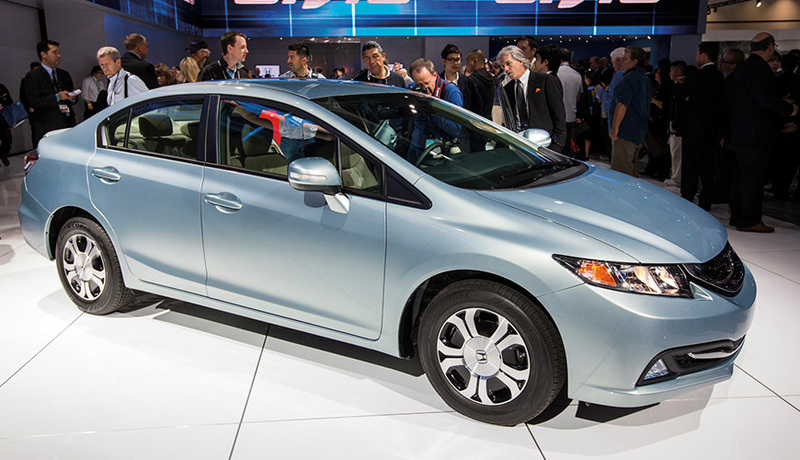 ​After the car debuts at the L.A. Auto Show, associates begin mass production of the 2013 Civic. It includes numerous upgrades, including styling updates and body and chassis improvements. 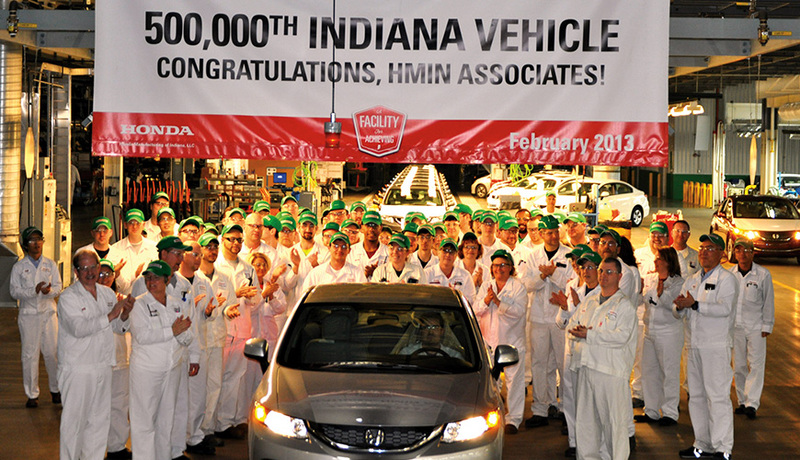 ​Honda Manufacturing of Indiana associates celebrate as the 500,000th vehicle produced in Greensburg rolls off the line. ​J.D. 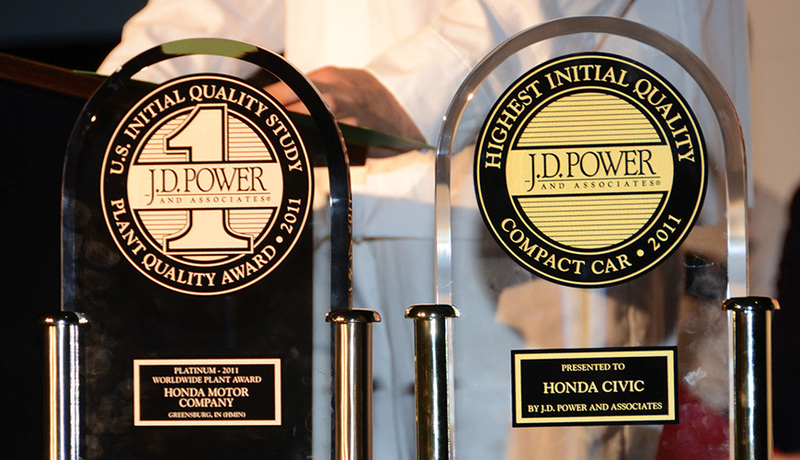 Power & Associates announces that the Civic is the highest ranked compact car in its 2013 Initial Quality Study. 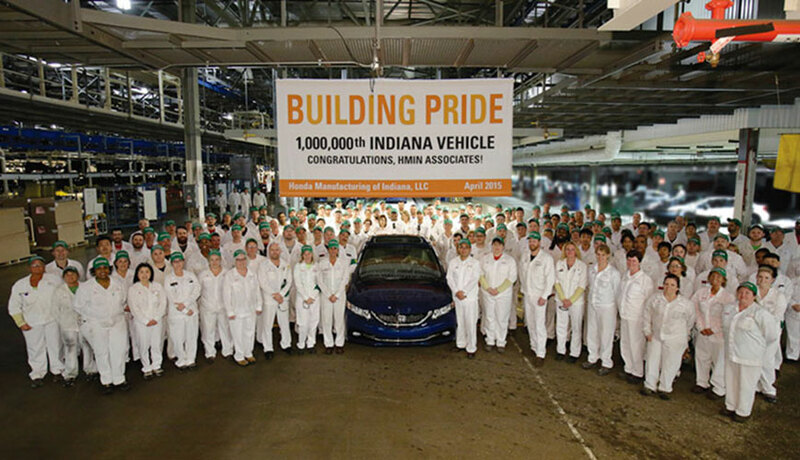 In April, Honda Manufacturing of Indiana associates celebrated the 1,000,000th vehicle produced in Greensburg. ​The start of production of the all-new Honda Civic Sedan begins. 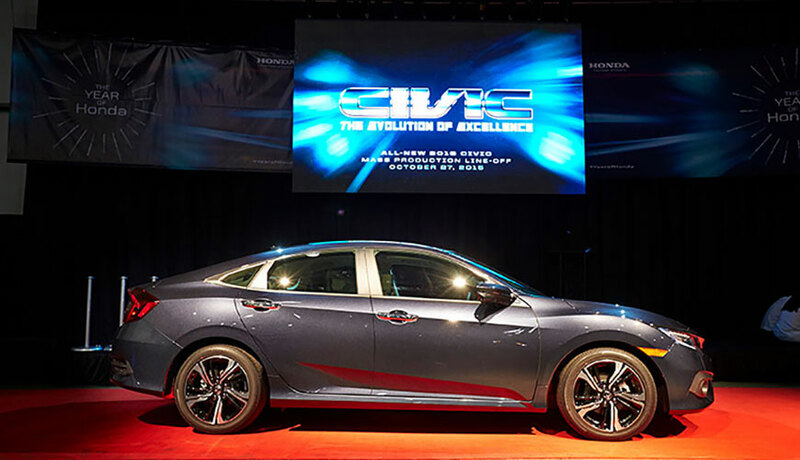 This 10th-generation Civic Sedan is the most ambitious remake of Civic in the model’s 43-year history. 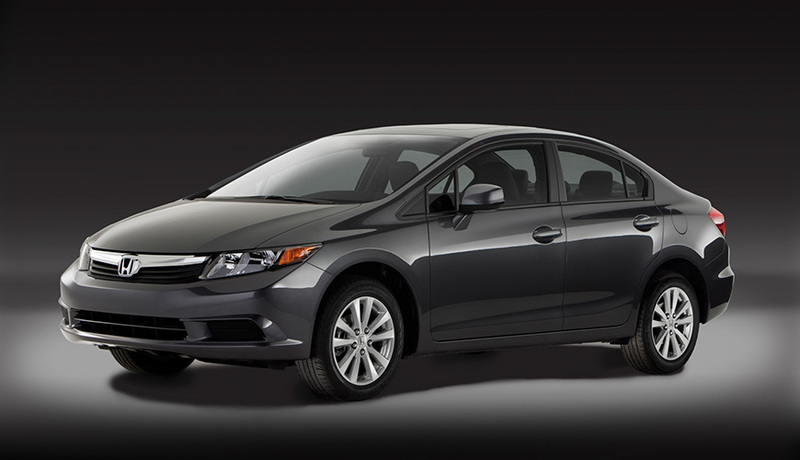 ​The Honda Civic is named North American Car of the Year. ​Mass production of the all-new CR-V begins. This is the first time the Greensburg plant has produced an SUV. 2018 mass production of the all-new 2019 Insight Hybrid begins. 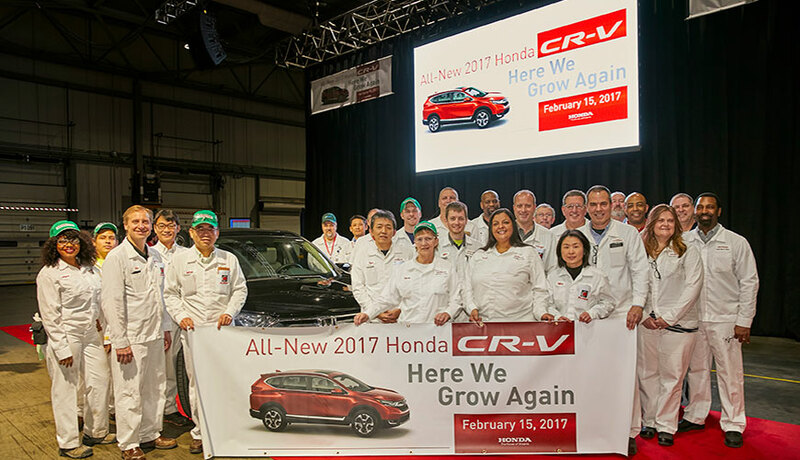 The launch reflects Honda’s increasing investment in the production of electrified vehicles in America. ​As a young man Soichiro Honda was gripped by a passion for racing. At age 22, and drawing on his skills as a mechanic, he adapted a V-8 Curtis Wright engine to race on a Ford chassis. He took the wheel himself and promptly broke the Japanese speed record, accelerating up to 75 miles per hour. Honda Racing was born! But it would be his uncanny ability to adapt racing technology to the wants, needs and desires of the consumer market that would propel his enterprising company into a global giant. His deep-rooted desire for relentless innovation remains at the very heart of all we do. It powers us to create today’s dreams, and forge them into tomorrow’s innovations. Honda Racing continues to win at all levels of motor racing – from Formula 1 and CART to Indy and Super Bike – and that’s a fitting legacy to a man who lived for victory. By seeking out our competition, we are motivated to do our absolute best. Be ready to do everything at the starting time. Togetherness: the driver, staff and machine are all vitally important. Be ready to solve unpredictable problems at all times. The only goal is winning. Concentrate every power on that one goal.